In November, I flew to Tanana, Alaska, to work with Cynthia Erickson and her 4-H girls. For two years they have presented at the annual Alaska Federation of Natives (AFN) gatherings. Their main thrust has been to talk about the devastating effects that drug, alcohol, sexual abuse and suicide have had on their lives and their community. They also challenged the adults to make necessary changes. Cynthia and her husband own and operate the grocery store and a bed and breakfast above the store in Tanana. Last year, friends from Michigan gifted her group with six Singer sewing machines, which they had started using. They hoped to make things to sell at fundraisers for future trips and also to give sewn items as Christmas presents, but several of the machines were not working right. Thanks to our wonderful quilters at Zion Lutheran Church in Fairbanks, I took plenty of small squares of Christmas fabric to make “disappearing nine-patch” hot pads. With a Thrivent Team gift card, I purchased material, batting, Insul-Bright, sewing notions, measuring tapes and fabric for snap bags, plus fleece for neck warmers and hats. When I arrived on Thursday, I cleaned, oiled and checked the sewing machines for missing parts. Keeley Kaveolook and I set up tables and machines in the area at the back of the store. Keeley is a young woman of Eskimo heritage who works at the store with Cynthia, helping with the girls and teaching Sunday school at the local church. She is a missionary with This Generation Ministries and plans to attend flight school next year. After the store closed on Thursday and Friday, the older girls came to sew. 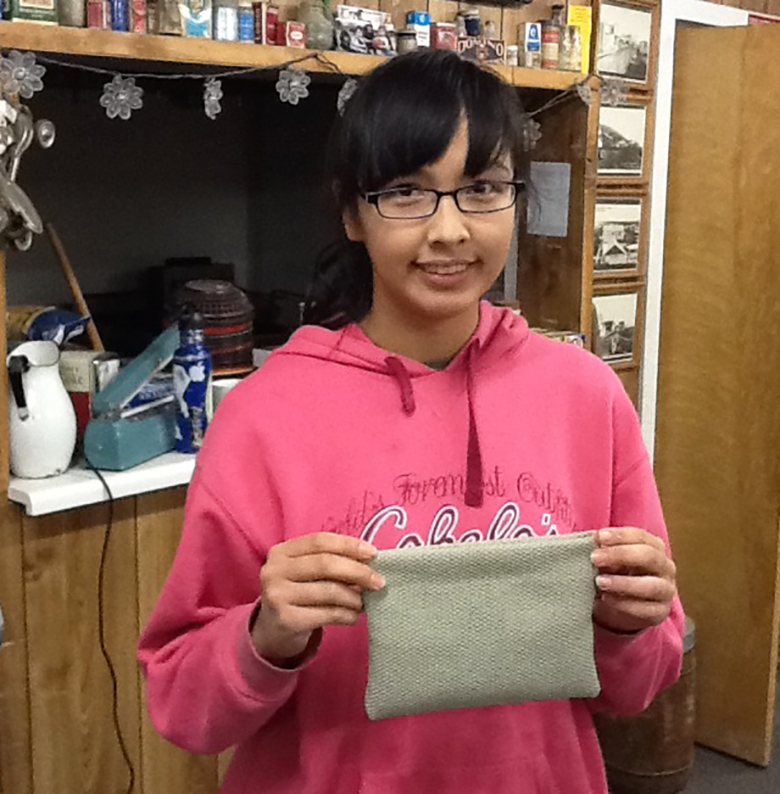 After a devotion and prayer, we started our first project—little bags—using upholstery samples. For our second project, we made pillowcases. I brought precut fabric, but after the girls saw how it was done, they went through their boxes of fabric and found pieces to put together that I would never have thought to use together. On Saturday and Sunday afternoon, we worked with the younger ones to make bags, fleece neck warmers and hats. The ladies practiced making potholders right up until the time they had to rush me to catch my plane back to Fairbanks. Some of the girls go to Cynthia’s nearly every night to visit and sew. They are still busy working on the items they learned to make. Three of the girls now have their own sewing machines at home and continue to practice what they have learned. One of the girls’ auntie said, "I don’t know why I thought my nieces were too little to learn these things. I am so proud of them." Our sewing project started a new spark among the ladies who have not sewn for a number of years. The machines have come out of the closet, creative juices are starting to flow and hope rises.